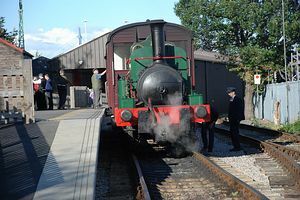 It can claim to be "the oldest working railway in the world" It was also home to the first commercially successful, revenue earning, steam locomotives designed by John Blenkinsop and built by Matthew Murray, which entered service in 1812. So started the Leeds Locomotive industry, going on to produce more locomotives than any other town or city in England, some years before Stephenson's locomotives! In 1960 the Middleton Railway became the first standard gauge railway to be taken over by a voluntary organisation. New 'Engine House' now open telling the story of the Leeds Locomotive Industry. Plenty to see and do under cover if wet. Next to the M621 at junction 5, less than 2 miles from Leeds City Centre. Leave the M621 northbound (towards city) at junction 5, and the M621 southbound(towards Wakefield) at junction 6.